On a rather miserable day 62 young athletes from 7 to 18 braved the conditions and competed for the club in the County Un-Even Age Juvenile Cross Country Championships in Galbally. For some athletes it was their first time in competition and they certainly had their eyes opened with rain and very wet underfoot conditions to contend with but fair play to everyone as they gave their full commitment to their competition resulting in the club winning 8 individual medals and three sets of team medals. 12 young ladies took to the start line of the U/9 event where Reiltin Morrissey put in a fabulous effort to cross the line in 6th place and an individual bronze medal for her efforts. Next across the line was Ruth Phelan in 13th with Ciara Joyce following in 17th and Eleanor Doyle coming through for 25th. These four girls combined to win the team bronze medals. In 28th place we had Olive Spillane Leane followed by Heidi Maher in 35th, Mairead Duggan 36th and Laura Fogarty 38th to finish 8th in the team competition. Aisling O’Reilly finished 41st with Maria Doyle 42nd, Niamh Gleeson 49th and Roisin O’Reilly 53rd and these four combined to finish 9th in the team competition. Five young athletes took part in the Boys event with newcomer to competition Billy Gleeson having a great race to finish 9th overall and win his first county championship medal – a bronze. Jack Guilfoyle finished 15th with Rogan Lyons 25th, Aidan Bourke 44th and Jamie Blake 60th to finish 5th in the team competition. Credit to all of these young athletes who are only seven and eight years old for competing in such tough conditions and coming through with flying colours. The U/11 division was our strongest representation with 25 athletes between the girls and boys taking to the start line. Saoirse Doran led the girls home with a terrific run to finish 6th with Alana Spillane having an equally good run to finish 9th. Both girls earned individual bronze medals for their efforts. Blathnaid Lloyd came through for 33rd with Martina Creedon finishing 44th helping the girls to 5th in the team competition. Dearbhla Gleeson finished 44th while Orla Duggan came 55th, Mary Kate Ely 64th and Emma Delaney 66th to finish 12th team overall. Cara Delaney, Sara McGinley, and Kate Delaney also competed very well to finish 67th, 71st and 72nd. In the Boys event the club also picked up an individual medal when Adam Spillane Leane came home in 9th place. Lorcan Burke finished 20th with Adam Phelan 25th and Luke Walsh 26th to finish fourth club. 28th place went to Jack Flanagan while Jimmy Campion finished 39th, Frank Doyle 40th and Jack Gleeson 41st to claim 6th in the team event. Sean Boland, Sean Lyons, Liam Ryan and Fred Power combined to finish 8th having finished 44th, 47th, 48th and 50th respectively while John Delaney and Shane Burke finished 6th and 57th. At U/13 level Tara Gleeson, Marian Campion and Una Duggan ran well to finish 26th, 27th and 30th respectively while Aaron Moore claimed yet another individual medal following his 8th place finish. Aaron McLoughlin came through for 14th with David Doyle 20th and Jake Bowe 22nd to finish third in the team competition. 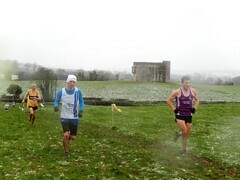 Also in action were Cathal Guilfoyle and Liam Ryan who finished 26th and 30th overall. Emma Gleeson was our first top three finisher on the day with a great display in the Girls U/15 to finish 3rd overall and claim the bronze medal – her first top three finish in cross country. Aine Duggan was our only other representative and she came through the field to take 9th place overall. Gavin Ryan, Eanna Guilfoyle and Kian Dunne competed in the Boys competition with Gavin having a terrific run to finish 4th overall. Eanna and Kian finished 13th and 17th and all three combined to finish fourth in the team competition. Success came the way of the club in the U/17 race where the Boys combined to finish second club. Dylan McLoughlin, Michael O’Mahoney, Charlie Tobin and Sean Burke made light of the muddy underfoot conditions to finish 6th, 9th, 10th and 11th overall. More success came in the Boys U/19 race where Nathan Bowe had another great run to finish 3rd overall. Well done to each and every one of the athletes involved. Conditions were tough but each one of them battled through and did themselves proud. Thanks to all the parents for their support and help on the day.